Slough, UK, 22nd January 2018 / Sciad Newswire / Hypha Discovery Limited, a leading microbial biotechnology company specialising in biocatalytic solutions for pharmaceutical and agricultural R&D companies, has launched its new line of PolyCYPs® kits. These provide scientists with a scalable, easy-to-use, oxidative catalytic technology to help meet regulatory safety testing requirements and for optimisation of drug leads prior to selection of the development candidate. The PolyCYPs® platform is the vision of CSO Jonathan Steele who, together with fellow scientists at Hypha Discovery and Professor John Ward at University College London – supported by funding from Innovate UK – has leveraged Hypha’s proven microbial biotransformation technology to create the PolyCYPs® range. The platform enables the synthesis of cytochrome P450 (CYP) derived human and other mammalian metabolites, as well as novel hydroxylated derivatives. The diverse enzymes in the kit have been cloned from a selection of Hypha’s most effective biotransforming strains and have been proven to catalyse a variety of oxidation reactions. 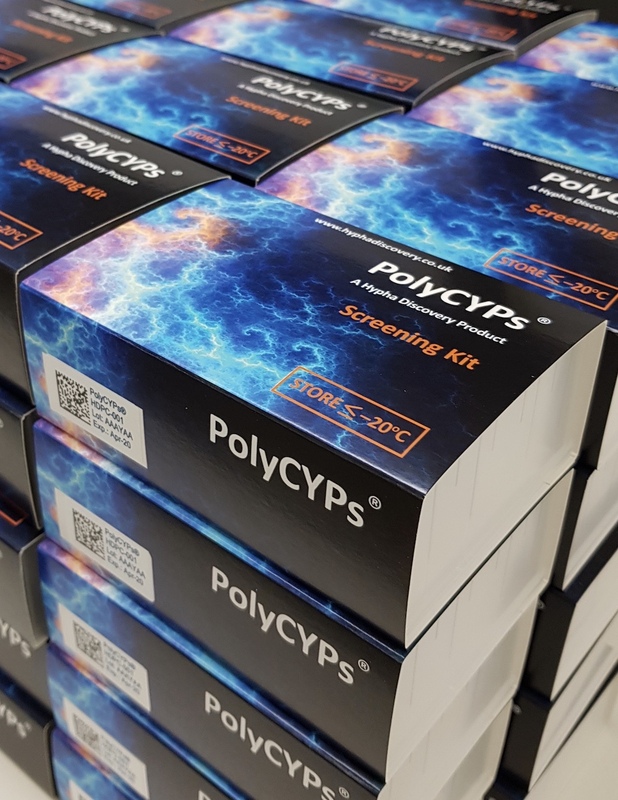 PolyCYPs® kits are designed for two key applications. The kits synthesise CYP-derived metabolites of pharmaceutical drugs and agrochemical compounds to enable their identification and biological testing. In addition, the kits provide medicinal chemists with a tool to make arrays of polar derivatives in isolatable yields for identification and bioassay. These new polar derivatives can have advantages such as improved drug distribution, metabolism and excretion properties, as well as increased solubility and potency, and could ultimately increase the number of viable new chemical entities in development pipelines. Scalability is a key feature of PolyCYPs® with resupply of specific enzymes in the form of freeze-dried powders. Alternatively, outsourced screening and/or large scale production and purification is available at Hypha. The kits are provided in an easy-to-use format containing everything needed to conduct reactions – the user simply needs to add water. Hypha Discovery Ltd is a UK-based biotechnology company that supports pharmaceutical and agrochemical companies by producing metabolites and new derivatives of drugs and pesticides in discovery and development. Hypha is an expert in the scalable production of drug metabolites and oxidised derivatives of lead compounds, and possess a wealth of experience in the discovery, isolation and structure elucidation of microbial natural products.